SNES Mortal Kombat 3 (USA) "playaround" in 22:54.22 by Dark Noob. 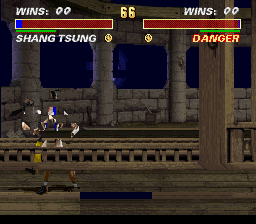 Here on TASVideos we have a rich history of movies of the games in the Mortal Kombat series, demonstrating the unique combos and glitches possible in each version. This video of MK3 for the SNES is no exception, as the author Dark Noob swaps between all the different characters to show off the wide variety of techniques, secrets, and humorous bugs that are possible. Though he is technically the villain, you have to admire Shao Kahn's dedication to keeping up with the action in his role as announcer as the fights get more and more bizarre. At times even he seems confused as to what is going on.